UHLC Dean Leonard M. Baynes tells students about the many ways they can help the school fulfill its vision for the future. 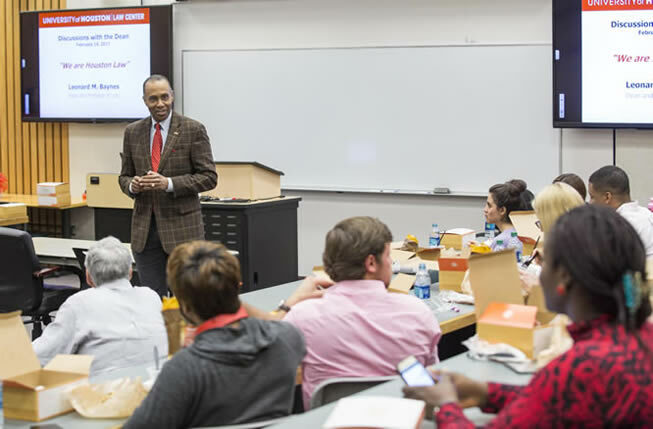 Feb. 15, 2017 — University of Houston Law Center Dean Leonard M. Baynes today outlined a five-year "Implementation of the Strategic Vision" for the school and asked students for their help in achieving the "lofty" goals during a "Discussion with the Dean" session. The plan with its lengthy list of goals is "very aspirational," the dean said, "but it is important to set goals and figure out ways to get there with strategies and action steps. The more you focus, the better your chances of succeeding." Backed by a PowerPoint slide presentation, he noted to students, staff and faculty members that the strategic vision was facilitated by Professors Seth Chandler and Michael A. Olivas and developed by committees comprised of faculty, staff and students in 2013 and that its Implementation was delegated to the dean, faculty committees, and the University as may be applicable. Objectives include attaining the second highest overall ranking in Texas, and improving Top 10 ranking of specialty programs from the current three to four; attaining the highest percentage of student employment 10 months after graduation among Texas law schools; increasing diversity and entry-level academic credentials; improving bar passage rate to top three ranking, and ultimately consistently being ranked number one in Texas; increasing reputation and presence both globally and nationally; increasing involvement in the community; encouraging greater alumni financial support; and attaining alumni and state support for a new facility. Baynes explained how students can help attain each of these goals. "We are all in this together," he said. "We will rise together, and the school will rise along with you." For example, on improving the bar passage rate, he said, graduates can help by identifying the small percentage of classmates who may be experiencing difficulties while studying for the bar exam. They may have financial, work or family issues. "It's not 'snitching,' " he said with a laugh, but rather reaching out to those who need encouragement or additional help with their studies. "For those who don't pass, it's often because of other factors in their life." He said, "Everyone who we admit is capable." Similarly, he said, there are steps students can take to improve their own employment opportunities as well as those of classmates. Apply for internships and summer fellowships that can lead to job offers; let the Career Development Office know of classmates who are struggling to find a job so counseling, job opportunities, and other resources can be made available to them; and, as practiced by the dean, take every opportunity when meeting people in the legal marketplace to ask if they have any job openings for Law Center graduates. On other goals, Baynes said the Law Center plans to hire a director to enhance global outreach for students and faculty and to host more national and international conferences. He also said the Cornerstone Club, established to kickstart a campaign for a new facility, is starting to raise contributions from school supporters and with plans to lobby the legislature for funding. In answer to a question from a student, the dean said the school makes a constant effort to enhance the standing of other specialty programs such as the Environment, Energy & Natural Resources Center, the Blakely Advocacy Institute, and Clinical Program by hosting conferences and other special events and by "spreading the word" through brochures and other material. In response to another question, Tiffany J. Tucker, interim Associate Dean for Career Development, said the school helps those interested in starting their own practice after graduation by providing alumni consultants to advise them on dos and don'ts and the use of tools at their disposal, including social media. Finally, Allen Emerson, manager of building services, said, plans for a new food outlet in The Commons are still in development and no timeline is set for opening.